With the impactful opening of: "Bella Jordan squints and takes aim. Just as she presses the trigger, a voice bellows, 'Mom!'" readers are quickly drawn in to Dead of WInter. Bella and her six-year-old son Max find themselves in Lily Dale, a summer cottage colony in rural New York. The area, mainly dormant between Labor Day and Columbus Day and deserted for six months due to blizzards across the Great Lakes, is a well-known spiritualist community populated by psychic mediums. By coincidence Bella and Max settle here. They had been on their way to Chicago to stay with Bella's deceased husband's mother. On a stop, they discover a pregnant tabby and bring her to a nearby animal hospital where she meets Dr. Drew Bailey. A microchip discloses she is Chance the Cat, belonging to Valley View Manor's innkeeper, Leona Gatto, a woman who was recently murdered. Bad weather and car trouble forces them to remain. Is this a twist of fate? The owner of the inn decides to renovate and hires Bella as the new manager, offering them a home. One evening while Bella is in the kitchen, she notices a glint of light outside the window in the middle of Cassadaga Lake. Concerned, because of the frigid cold and lack of boaters, she believes it may be a night fisherman, but her curiosity is piqued when she hears the sound of a gunshot and a scream. The following morning she discovers a tarp on the shore which happens to contain a dead body. Bella contacts the police, learning the victim was part of a crime syndicate that allegedly transports stolen property from Canada into New York. Max befriends Jiffy, who lives a few doors down. The boys decide they're too old to be met at the bus stop, but that doesn't stop Bella. Jiffy's mom Misty is a little too lax when it comes to her son which is a concern to Bella, and with a killer on the loose, Bella takes no chances. "'I'm here to . . . deliver this to Max, from Gammy.'' She holds up a mason jar wrapped in a dish towel. 'It's still hot.'" "'Lime and ginger pho soup. She said to tell you it would have been better if her Crock-Pot was working, but she did the best she could on the stove. Oh, and she says it's the best cold remedy, and she hopes he feels better soon." "How does she know he's sick?" Calla shrugs, handing over the jar of soup. "It's Lily Dale." "Ah, yes, Lily Dale—not merely a typical small town where everyone knows everyone else's business, but an atypical small town whose psychic residents seem to know . . . well, everything. Maybe that's why Bella seems to be the only one around here with a nagging concern over the body in the lake." Due to the storm, school is dismissed early, but Jiffy doesn't return home. Though the murderer hasn't been apprehended, no one appears frightened. Then a second body is found—that of a neighbor—so the clairvoyants try to find clues as to Jiffy's disappearance as well as the identity of the killer. Dead of Winter is written in the present tense which adds tension to the story. Several scenarios are played out presenting differing subplots, making this a fast-paced and suspenseful thriller. 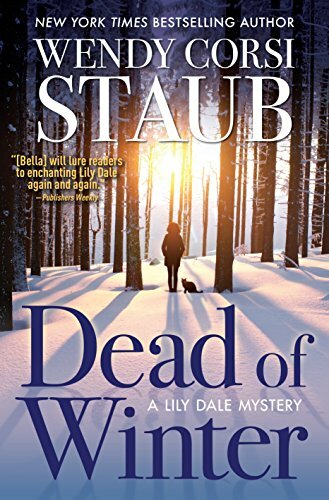 This is the third installment of the Lily Dale series, blending sleuthing, the paranormal, and a touch of romance to produce a spectacular whodunit.